...beards that go all the way down to their adam's apple and back around the neck. What exactly is a neckbeard? I stumbled on them in "totally looks like". I like guy #2 above the best, even though the picture is blurry. That's creative! It's iconoclastic! Which one do you like best? I'm imagining an alternate universe in which the fashion for men is to be totally bald and clean shaven, excepting for gigantic neckbeards. The neckbeard meme has apparently infected my brain. Ummm ... no. I didn't like that look on Sam the Eagle and I don't like it on ... aw, hell, I DON'T LIKE IT, PERIOD! Eewww! Not crazy about this look and I don't know why, but I think it looks silly when a man's beard is longer than their hair! We are so used to seeing the neck cleanly shaven, for the most part, unless someone does have a full beard...then I suppose we don't really notice the neck hair is 'overgrown'. I must say that I am glad this isn't a current style and hope it doesn't become one! Great find, Ruth. Why would anyone want a neck beard? It doesn't look comfortable, it probably itches, it would catch all the drips off a spoon, it would begin to stink if not properly washed, and to a woman ... I think a woman would rather have a dog. The bestlooking one is the cat, imo. And cleanest too! 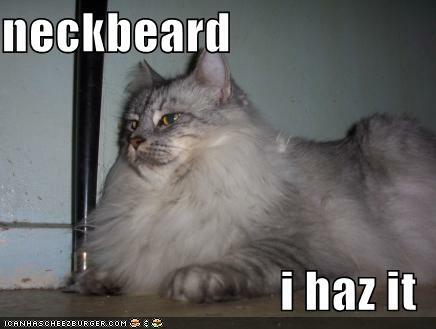 That cat doesn't have a neckbeard, this one does. I agree. The cat looks like my cat. Neckbeards are the stupidest fashion statement I can think of. 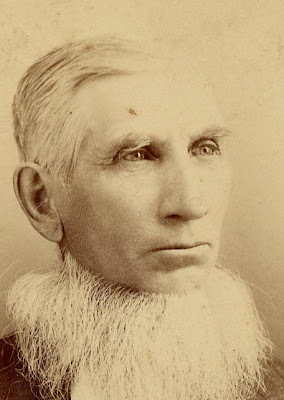 The only problem with those neck beards is that some look like women's furs, while some look fake, like they don't belong on the owners, like something they are wearing. Sorry, Ruth, but I don't share your enthusiasm, lol. Makes one wonder. I always hated "Republican Sam". I'm not convinced the second guy is even human. Seriously, who has hair there? Turn that into a ring of dreadlocks and it might be cool. I grant you that he's hairier than the median. Some necks are hairier than others. These guys could probably grow an astonishing ring style neckbeard like guy #2 should they choose to do so. One might even use a neckbeard for combover.